The following are some great Wikipedia, the free encyclopedia information for those wanting to know history. The Dodge Charger is an American automobile manufactured by the Dodge division of Chrysler. 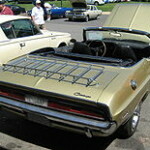 There have been several different Dodge vehicles, built on three different platforms and sizes, all bearing the Charger nameplate. The name is generally associated with a performance model in the Dodge range; however, it has also adorned subcompact hatchbacks, full-sized sedans, and personal luxury coupes. The Dodge Challenger is the name of three different generations of automobiles marketed by the Dodge division of Chrysler. 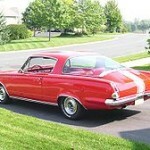 The Dodge Silver Challenger was produced in 1959. 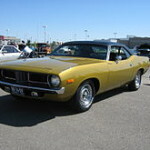 From 1970 to 1974, the first generation Dodge Challenger pony car was built using the Chrysler E platform, sharing major components with the Plymouth Barracuda. The second generation, from 1978 to 1983, was a badge engineered Mitsubishi Galant Lambda. 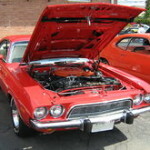 The third, and current generation, was introduced in 2008 as a rival to the evolved fifth generation Ford Mustang and the reintroduced fifth generation Chevrolet Camaro. 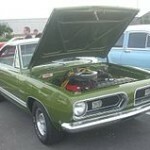 The Plymouth Barracuda is a two-door car that was manufactured by the Plymouth division of the Chrysler Corporation from 1964 to 1974. The Plymouth Road Runner was a performance car built by the Plymouth division of the Chrysler Corporation in the United States between 1968 and 1980. In 1968, the first muscle cars were, in the opinion of many, moving away from their roots as relatively cheap, fast cars as they gained options. 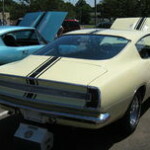 Although Plymouth already had a performance car in the GTX, designers decided to go back to the drawing board and reincarnate the original muscle car concept. 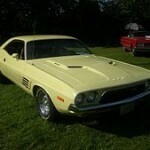 Plymouth wanted a car able to run 14-second times in the quarter mile (402 m) and sell for less than US$3000. 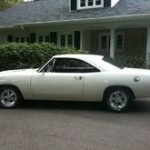 Both goals were met, and the low-cost muscle car hit the street. 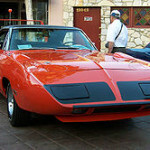 The success of the Road Runner would far outpace the upscale and lower volume GTX, with which it was often confused.